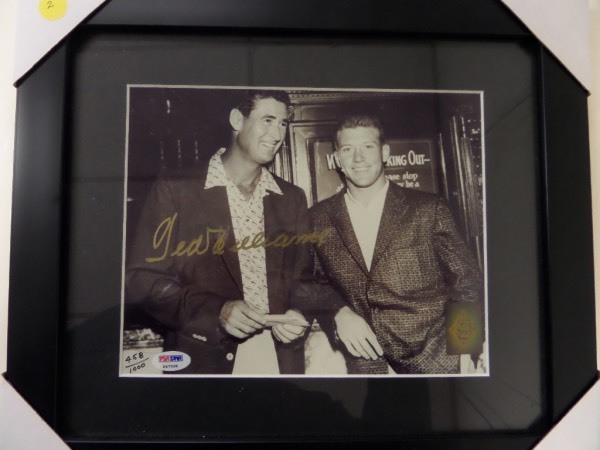 Coach's Corner - Ted Williams hand signed/custom framed PSA & Green Diamond Red Sox photo. Go Back to Lot List Ted Williams hand signed/custom framed PSA & Green Diamond Red Sox photo. This rarely seen 1952 B&W 8x10 image shows both Ted and Mickey Mantle at a banquet, dressed up, and smiling for the cameras. It comes gold paint pen signed by Ted, then matted and wood framed to you, and has BOTH the PSA numbered hologram, and Ted's own Green Diamond hologram and lifetime LOA intact. Great chance, obviously real with TWO high value COA's, and sold here at, or above this price.